graymustang, gunscrewguy and Steve_In like this. Post pictures if you can. Took me a while with my cyber challenge impairment. The 50-70 was used as a military rifle before the 45-70 which was developed in 1873. Early ones had wraped brass cartridges and were said to stick in the breech. Soldiers had to use a knife to extract them. George A Custer had a special model trapdoor built up in which he claimed he shot an antelope at 600 yards (he kind of walked it in like artillery, not the first shot). During the buffalo days it was called by many the Big 50. Some of the cartridges had a kind of copper covering over the primer. The rifle itself was a conversion of the Springfield rifled musket as used during the Civil War. Instead of scrapping them they rebarreled them using the Allin conversion. The rifle started life as a Springfield rifles musket. The Springfield musket was the primary Union firearm. It could have seen action before the conversion. I am not sure when the Cavalry carbines were developed, They called Custer's rifle the Officers model which was cut down form the regular arm. If in good shape with a good bore it can be shot with black powder. Cases may be kind of hard to come by but the cartridge is a good one. graymustang, Gareth Holland and M1Riflenut like this. Have some of those Allen conversion cartridges, these are the original early designated 1867 version, rifle not carbine or cadet cartridges. 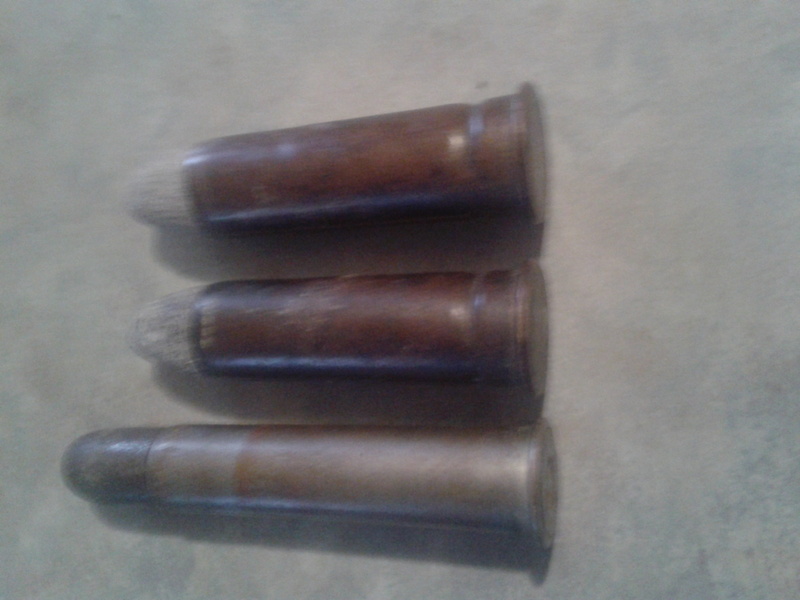 Anyway it was a straight walled drawn copper affair, lead sort of pointed bullet, the base was flat with no obvious indication of where the primer was, thou it was centerfire, the priming arrangement being placed inside the case against the base, held in place by big crimping grooves just up from the base . Later (1882) it moved to outside priming in gov loading. Both 45-70 and 50-70 gov issue, were drawn copper cased up into the 1880s. The wrapped foil case and problems being properly associated with Martini .577/450. The Allen's had extraction issues related to cartridge swelling, especially in a pitted or dirty chamber. The soft cartridge material would adhere into the pits of a corroded chamber or on crud/rust in the chamber, causing the extractor to tear thru the cartridge rim or skip around it, leaving a stuck case. 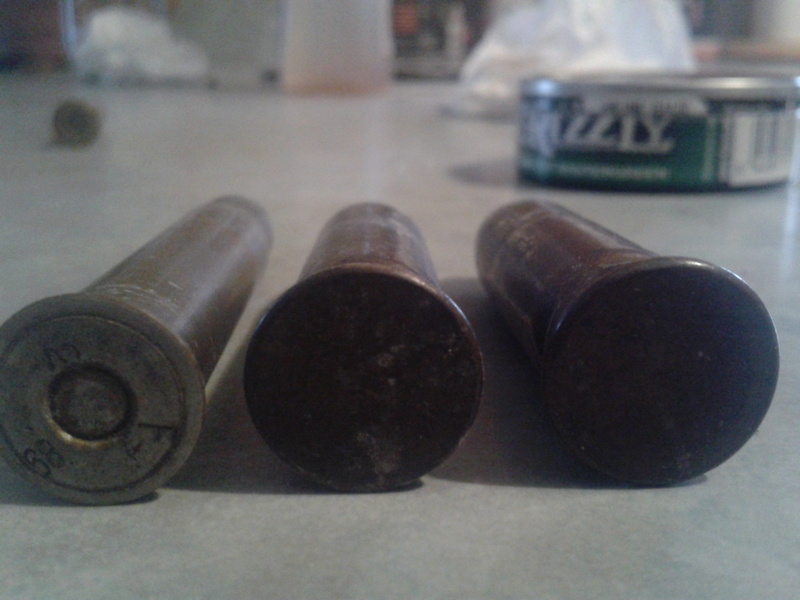 Below the cartridge on the left is a tin washed copper cased gov arsenal 45-70 case from 1885. Designated the 50-70-450 from a rifle velocity was about 1.300 fps, in government use from 1867 til 1873 when the 45-70 replaced it. Last edited by graymustang; 03-28-2019 at 03:29 PM. I shoot a 50-70 Sharps Business Rifle with Black Powder and paper patched bullets. I have heard that some load the 50-70 with smokeless, but have no knowledge on powder utilized, bullet alloy/weight/diameter, etc. As with all original rifles, best better slug the bore to determine its diameter. graymustang and mr surveyor like this. JohnD13 and Gareth Holland like this. 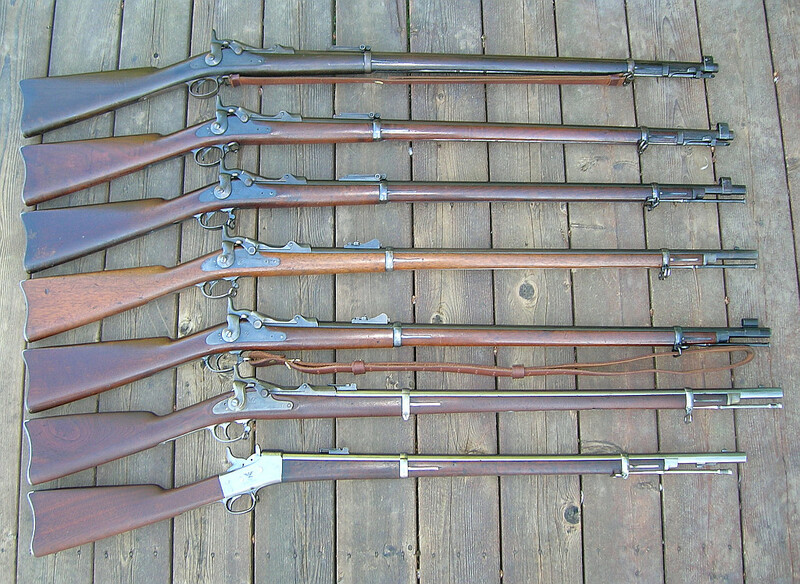 From what I've picked up over the years, there are three basic models of the 50-70, the 1865, 1866 and 1868. This has to do with continued improvements to the Allen system, the last improvement being the one also used in the later 1873 trapdoor. Think this makes your rifle a model of 1866 Springfield. I should ahve stipulated that they were aconversion from muzzle loader to cartridge. The original Springfields they converted from were 58 cal using the minnie ball. They replaced the whole barrel. My memory was a bit shaky but Grey Mustang had the copper cartridges which came first. They supposedly had a painting of Custer's last stand showing a trooper trying to dig out a cartridge with his knife. Those big hammers were stylish in the early cartridge days. Many liked the looks of the Sharps because of them also. The Lyman manuals have smokeless loads for the 50-70. I am a big fan of the 50-70. I have converted many H&R 50 cal. Huntsman muzzleloaders to 50-70 and rebarreled a rolling block and a falling block rifle to 50-70. Ohio finally allowed strait walled rifle cartridges for deer hunting the past 3 years and I have taken a couple deer with the 50-70.
graymustang and Steve_In like this. Here are some Springfields. The bottom two (Trapdoor and a US Navy Rolling Block) are in 50/70. It's a fun round to shoot with black powder loads. graymustang and 94win30wcf like this.